With 9 years under her belt as a Qualified Nail Tech, Corrine has the knowledge and experience to give us the downlow on all of those little questions we have about our nails. Such as, is shellac damaging? Is SNS actually just acrylic? Read on to hear Corrine's expert point of view. Hi! I run and own Luxe Nail Studio, a dedicated nail studio located in Doubleview, in Perth. When starting up my business, I decided to specialise in, and focus on, the part of the industry that I am most passionate about - so I offer my clients specialist shellac and gel polish manicures, with the offering of some cool nail art (no 1999-esque painted roses here!). I decided not to focus on acrylic nails / hard gel extensions; after years of working with them previously and never really 'loving' it, I decided to take a fresh approach and leave the acrylics behind and really try to take care of the natural nail itself. I am a self-confessed perfectionist, I take enormous pride in my work and I like to think that I offer my clients a very high-quality product, for those who wish to go to a technician who is truly passionate about what they do. Which is, caring about your natural nail condition, and providing you with the best result that I can, with gel polish and shellac. Nail Myth 1: Does Shellac ruins my nails?...FALSE! Nail enhancements / shellac / gel polish doesn't ruin natural nails - improper care from a nail technician does. And, yes, peeling off your shellac / gel polish, at home takes layers off in a single moment, so always try your best not to do this. It is best to wait for your appointment, and have it removed in-salon, and ensure the good health of your nails. Correct care of your nails and a knowledgeable, gentle technician will ensure your own nails remain healthy during and after your nail visit. The heavy filing and drills are all not necessary. My aim before applying your shellac is to lightly buff your nails, push back any cuticle from the nail surface, ensuring a clean, oil-free surface, ready for your gel polish. Well, the jury is out on this one. There are many varying factors. SNS actually stands for 'Signature Nail System' which is just the name of a company who sells nail products. The company offers the Acrylic-dip method yes; I said acrylic. SNS is simply a name that the clever marketing peeps gave the dip method. I personally do not work with acrylic systems, and this is seemingly just another way of applying acrylic. In reality you are getting the same products on your nails and it's actually a little more brittle than acrylic and gel extensions (applied the old-school way). The Signature Nail System brand markets this product as neither a gel or acrylic. They also tell you that it is 'healthier' for your nails. This however, just isn't true. The dip method is a polymer and resin layered together which means the overall makeup of the enhancement is in-fact acrylic. No you-beaut great-for-your-nails product here unfortunately. Nail Myth 3: Are white spots on the fingernails are due to calcium deficiency?... FALSE! These white spots, called leukonychia, are usually caused by injury to the nail matrix. So, if you bumped your finger a month ago, and then you see a white spot growing up your nail, there's your answer. Occasionally, they can also be a sign of infection or a skin condition. There is growing reports that this could also be a dehydration issue so keep on using your cuticle oil ladies! Nail Myth 4: Should Shellac/Gel Polish be removed to let nails "breathe"?... FALSE! 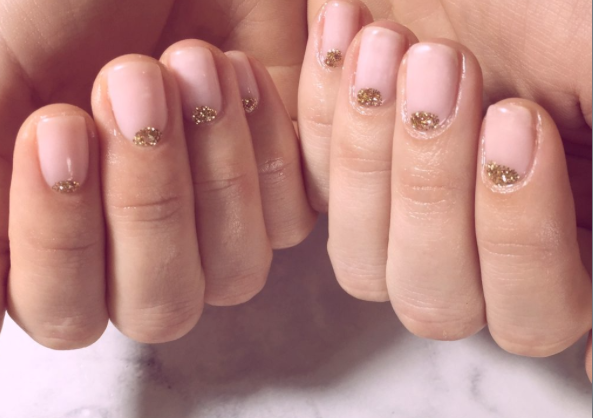 Nail Myth 5: Is cutting or trimming your cuticle beneficial?... FALSE! Cuticles are a barrier to prevent infection to the nail, so cutting all of it off increases the likelihood of infection to the nail bed. Not so good eh? Gently pushing back cuticles is enough to care for your cuticles, along with daily application of a good quality cuticle oil, like CND's Solar Oil. Nail Myth 6: Is Shellac different to Gel Polish?... FALSE! 'Shellac' has become the universal name for gel polish manicures, but it actually refers to the brand name CND Shellac. Just like how we refer to 'BandAids', There are many other brands on the market, and really it's an individual choice about what product your particular nail technichian uses. Nail Myth 7: If I get Shellac or Gel Polish how long will it last? Most gel manicures will last 14 days. But it depends on what you are doing with your hands. Some of my clients can get over 3 weeks out of their gel manicures! I find that mine last about two good weeks, seeing as I am doing most of the above, plus I am always accidentally filing them, when doing my clients nails. After two weeks they just start to look a bit tired and you can see a gap between my cuticle/base of nail bed, where the colour has grown out. I really hope that you found this blog informative, if you would like to contact me to make an appointment, please feel free to email me on luxenailstudio@hotmail.com or text me (within business hours) on 0435 885 631.